(Nanowerk Spotlight) Fractals are structures built up from repeated sizings of a simple shape to make a complex one. A fractal is a geometric structure that can repeat itself towards infinity. Zooming in on a fragment of it, the original structure becomes visible again. In biological systems, fractal structures can be found everywhere – bronchial trees, vasculature, and nerve cells. These amazing structures can provide a specific interfacial contact mode that is highly efficient for absorbing sunlight, transporting nutrition, exchanging oxygen and carbon dioxide, and signal transduction. Due to their attributes, artificial fractal structures (read more: "Building 3D fractals on a nanoscale") have attracted considerable scientific interest for their appealing applications in fractal antennas, solar cells, and biosensors. "Recently, fractal nanostructures have been discovered on the surface of cancer cells" Shutao Wang, a professor at the Institute of Chemistry, Chinese Academy of Sciences, tells Nanowerk. "These fractal nanostructures result in cancer cells having a higher fractal dimension than normal cells, which can be used to distinguish cancer cells from normal cells. This important finding inspired us to explore whether fractal nanostructures can be utilized to program interfacial materials for cancer cell recognition, which will be of great importance for clinical diagnosis." Reporting their findings in the May 29, 2013 online edition of Advanced Materials ("Programmable Fractal Nanostructured Interfaces for Specific Recognition and Electrochemical Release of Cancer Cells"), Wang and his team have now demonstrated the fabrication of programmable fractal gold nanostructured interfaces and their outstanding specific recognition of rare cancer cells from whole blood samples along with their effective release capability. By engineering the fractal gold nanostructures to match the surface fractal features of cancer cells, the researchers achieved a high cell-capture efficiency of rare circulating cancer cells from whole blood samples without any assistance of complex fluidic manipulation. The team generated three kinds of fractal gold nanostructures (FAuNSs) with controllable fractal dimensions using a one-step electrochemical deposition approach. "The electrodepositing potential and supporting electrolyte are two major factors influencing the topography of the nanostructures," explains Wang. "In our experiment, relative smooth nanostructures were produced at low potentials, and nanostructures with more complex details were generated at higher potentials." 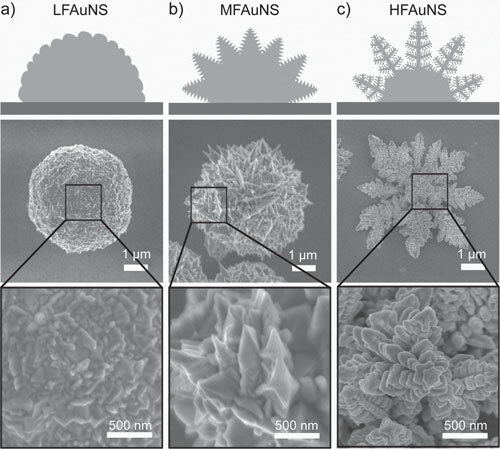 Exploring the potential of their FAuNSs, the scientists found that the fractal structured interfaces showed a much higher cell-capture efficiency compared to flat gold nanostructures (62% ± 13% for HFAuNS versus 3% ± 1%, for flat). Wang notes that an average of 98% of the captured cells can be easily released with outstanding cell viability (ca. 95%) through an electrochemical cleavage of the Au-S bonds, which could provide undamaged cancer cells for further studies, such as phenotype assessments, genomic/mRNA analysis, and screening of anticancer drugs. With increasing accuracy, "liquid biopsies" – where circulating tumor cells (CTCs) are isolated from blood samples – are becoming a viable complement or even alternative to invasive biopsies of metastatic tumors. CTCs are of great interest for evaluating cancer dissemination, predicting patient prognosis, and also for the evaluation of therapeutic treatments, representing a reliable potential alternative to invasive biopsies and subsequent proteomic and functional genetic analysis. The challenge with liquid biopsies is to build a system that makes it possible to perform both the isolation and the molecular characterization of CTCs, preferably at a single cell level. "The biggest problem is that CTCs, in clinically relevant concentrations, are very rare: they are found in numbers in the order of 1 to 10 CTCs per mL of whole blood in patients with metastatic disease," explains Wang. "The existing technologies cannot reach the performance requirement of clinics, due to the low capture efficiency, low purity, and low specificity. However, advanced nanomaterials provide new chance to solve this problem and we hope that our three dimensional nanostructures can highly improve the capture efficiency." In particular, due to its high release rates, the FAuNSs assemblies provide an excellent platform for releasing captured CTCs undamaged for further studies, such as phenotype assessments, genomic/proteomic analysis, and screening of anticancer drugs.